Best of luck to the Dublin senior footballers who play Mayo in the All Ireland final tomorrow. Nearly the whole school will be cheering you on! Ms. Walsh will be cheering on her beloved Mayo in Croke Park and Jimmy McNeela from Mr. Kirwan’s 2nd class is also hoping that Mayo bring the Sam back to Achill where his father is from. Emmet O’Conghaile is Lucan’s sole representative on the Dublin panel this year. Unfortunately Emmet recently suffered a shoulder injury which rules him out of contention tomorrow but he has been an important member of the panel all year. 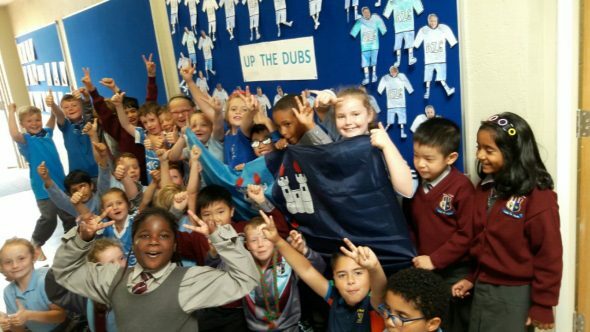 Below are Mr. Kirwan’s 2nd class cheering on the Dubs…….while Jimmy cheers on Mayo!!! Hopefully it’s a cracker of a game!